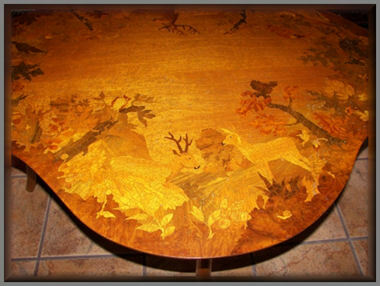 This month, we are featuring some very beautiful coffee tables made by the Buchschmid & Gretaux Wood Inlay Company. B & G indeed made some truly wonderful pieces of inlaid furniture, but unfortunately these are not seen anywhere near as often as their more well known wood inlay pictures. To redress that imbalance we are bringing you the two somewhat differently shaped B & G coffee tables belonging to Cary Ridings and Neil Thomas. 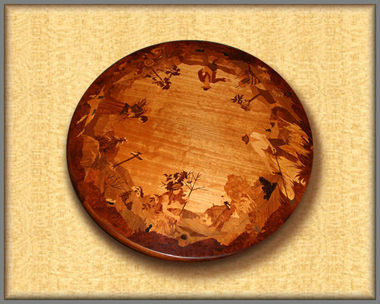 The inlaid designs are classic B & G style, and of course, are highly desirable. The top three photos of these Buchschmid and Gretaux coffee tables show a well loved and daily used example belonging to Cary Ridings. 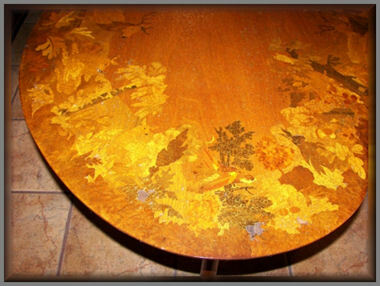 Cary's parents purchased this pear shaped coffee table known as The Four Seasons Coffee Table, from Buchschmid and Gretaux when they were stationed in Germany over forty years ago. The coffee table has remained in Cary's family ever since and displays its honest wear and tear in the furniture themed guise of a trusted family servant and loyal companion. The varnish, and some of the veneers, have inevitably succumbed to the passage of time and use, but, the small missing pieces of veneer could easily be replaced and repaired by any reasonably competent marquetarian. The varnish restoration could present a more difficult task. It would more than likely involve stripping the old varnish back to the veneer level and then after ensuring that the veneers are nice and flat and smooth, applying a completely new covering of varnish. The new varnish cover could easily involve applying several coats with flattening any "nibs" in between the coats. The varnish itself may even need to be slightly colour matched to ensure an accurate restoration. Whatever is decided as to the ultimate fate for this table, it is, nonetheless, an original Buchschmid and Gretaux coffee table in an untouched or modified condition. 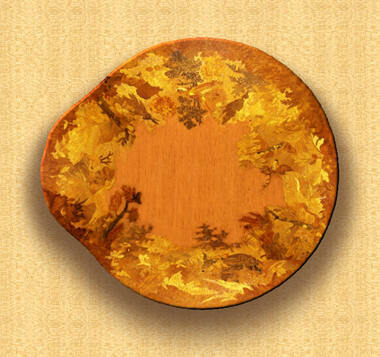 It bears its little scrapes and scars well, and displays itself as a most attractive piece of very practical furniture. It is wonderful to see that it has remained in the same family for all of its existence. We hope the Ridings family will continue to enjoy their Buchschmid and Gretaux coffee table for many more years to come. We thank Cary Riding for sending the photographs in to us. 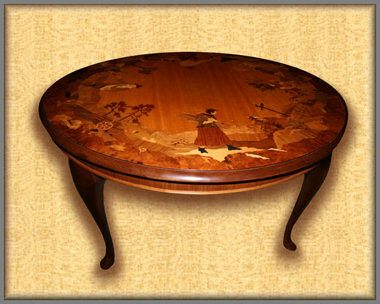 The circular shaped coffee table belongs to Neil Thomas and is a superbly presented example of Buchschmid and Gretaux marquetry decorated furniture. 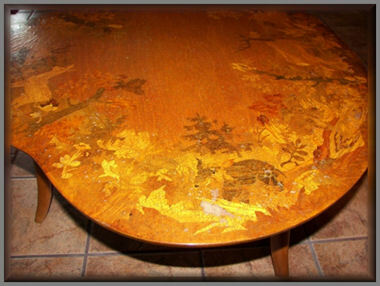 The table still retains its original production labels and is in amazingly superb original condition. 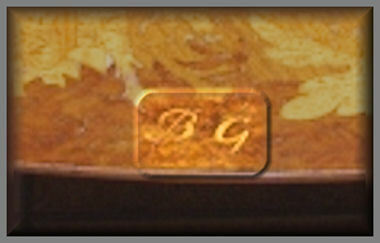 Such labels, along with the inlaid BG signature really do help to authenticate genuine Buchschmid and Gretaux pieces. A little craquelure (fine cracks and lines that develop with age, time and enviromental conditions) is just noticable in some of the underneath varnish. This is a good sign of authenticity as craquelure is extremely difficult (or almost impossible) to reproduce or forge with a level of convincing accuracy to the educated eye. This particular circular Buchschmid and Gretaux coffee table looks, from the photographs, to be in truly original condition. In fact it would probably be true to say that time and ideal conditions have actually mellowed the table into a superbly visually balanced example of the inlayer's art. 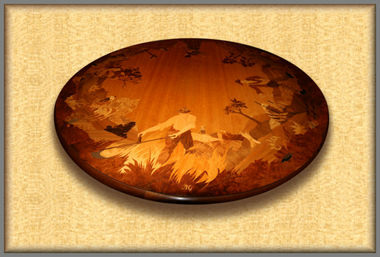 Buchschmid and Gretaux were reputed to have had their own unique recipe for the finish - or varnish - they used for their inlaid pictures and furniture. From the look of their work it would, indeed, seem to be a very high quality varnish that easily stands the test of time. We wonder, how many of today's petro - chemically derived finishes will last as long, and be as visually beautiful when they are fifty years or more old, than the Buchschmid and Gretaux recipes of yesteryear? 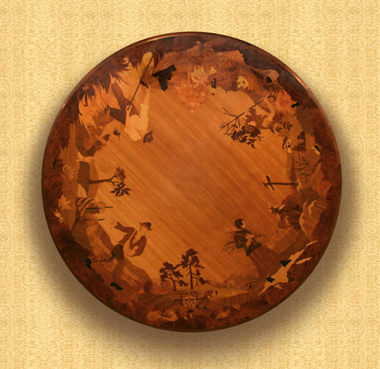 All in all, those craftsmen from a now bygone age, made some genuine marquetry products that were produced without the "help" of today's technology - and doesn't it show in their almost tactile warmth and depth? Click the above button to return to page 8 of "Can You Help"
Click the above button to visit page 10 of "Can You Help"